"A cowboy is an animal herder who tends cattle on ranches in North America, traditionally on horseback, and often performs a multitude of other ranch-related tasks. The historic American cowboy of the late 19th century arose from the vaquero traditions of northern Mexico and became a figure of special significance and legend. A subtype, called a wrangler, specifically tends the horses used to work cattle. In addition to ranch work, some cowboys work for or participate in rodeos. Cowgirls, first defined as such in the late 19th century, had a less-well documented historical role, but in the modern world have established the ability to work at virtually identical tasks and obtained considerable respect for their achievements. There are also cattle handlers in many other parts of the world, particularly South America and Australia, who perform work similar to the cowboy in their respective nations. The cowboy has deep historic roots tracing back to Spain and the earliest European settlers of the Americas. Over the centuries, differences in terrain, climate and the influence of cattle-handling traditions from multiple cultures created several distinct styles of equipment, clothing and animal handling. As the ever-practical cowboy adapted to the modern world, the cowboy's equipment and techniques also adapted to some degree, though many classic traditions are still preserved today. The English word cowboy has an origin from several earlier terms that referred to both age and to cattle or cattle-tending work. The word 'cowboy' appeared in the English language by 1725. It appears to be a direct English translation of vaquero, a Spanish word for an individual who managed cattle while mounted on horseback. It was derived from vaca, meaning 'cow,' which came from the Latin word vacca. Another English word for a cowboy, buckaroo, is an Anglicization of vaquero. At least one linguist has speculated that the word 'buckaroo' derives from the Arabic word bakara or bakhara, also meaning 'heifer' or 'young cow', and may have entered Spanish during the centuries of Islamic rule. Originally, the term may have been intended literall--'a boy who tends cows.' By 1849 it had developed its modern sense as an adult cattle handler of the American West. Variations on the word 'cowboy' appeared later. 'Cowhand' appeared in 1852, and 'cowpoke' in 1881, originally restricted to the individuals who prodded cattle with long poles to load them onto railroad cars for shipping. Names for a cowboy in American English include buckaroo, cowpoke, cowhand, and cowpuncher. 'Cowboy' is a term common throughout the west and particularly in the Great Plains and Rocky Mountains, 'Buckaroo' is used primarily in the Great Basin and California, and 'cowpuncher' mostly in Texas and surrounding states. The word cowboy also had English language roots beyond simply being a translation from Spanish. Originally, the English word 'cowherd' was used to describe a cattle herder, (similar to 'shepherd,' a sheep herder) and often referred to a preadolescent or early adolescent boy, who usually worked on foot. (Equestrianism required skills and an investment in horses and equipment rarely available to or entrusted to a child, though in some cultures boys rode a donkey while going to and from pasture) This word is very old in the English language, originating prior to the year 1000. In antiquity, herding of sheep, cattle and goats was often the job of minors, and still is a task for young people in various third world cultures. Because of the time and physical ability needed to develop necessary skills, the cowboy often did began his career as an adolescent, earning wages as soon as he had enough skill to be hired, (often as young as 12 or 13) and who, if not crippled by injury, might handle cattle or horses for the rest of his working life. In the United States, a few women also took on the tasks of ranching and learned the necessary skills, though the 'cowgirl...did not become widely recognized or acknowledged until the close of the 19th century. On western ranches today, the working cowboy is usually an adult. Responsibility for herding cattle or other livestock is no longer considered a job suitable for children or early adolescents. However, both boys and girls growing up in a ranch environment often learn to ride horses and perform basic ranch skills as soon as they are physically able, usually under adult supervision. Such youths, by their late teens, are often given responsibilities for 'cowboy' work on the ranch, and ably perform work that requires a level of maturity and levelheadedness that is not generally expected of their urban peers. The term 'cowboy' was used during the American Revolution to describe American fighters who opposed the movement for independence. Claudius Smith, an outlaw identified with the Loyalist cause, was referred to as the 'Cow-boy of the Ramapos' due to his penchant for stealing oxen, cattle and horses from colonists and giving them to the British. In the same period, a number of guerilla bands operated in Westchester County, which marked the dividing line between the British and American forces. These groups were made up of local farmhands who would ambush convoys and carry out raids on both sides. There were two separate groups: the 'skinners' fought for the pro-independence side; the 'cowboys' supported the British. In the Tombstone area in the 1880s, the term 'Cowboy' or 'cow-boy' was used pejoratively to describe men who had been implicated in various crimes. One loosely organized band was dubbed 'The Cowboys,' and profited from smuggling cattle, alcohol, and tobacco across the U.S./Mexico border. The San Francisco Examiner wrote in an editorial, 'Cowboys [are] the most reckless class of outlaws in that wild country...infinitely worse than the ordinary robber.' It became an insult in the area to call someone a 'cowboy,' as it suggested he was a horse thief, robber, or outlaw. Cattlemen were generally called herders or ranchers. The Cowboys' activities ultimately ended with the Gunfight at the O.K. Corral and the resulting Earp Vendetta Ride. The origins of the cowboy tradition come from Spain, beginning with the hacienda system of medieval Spain. This style of cattle ranching spread throughout much of the Iberian peninsula and later, was imported to the Americas. Both regions possessed a dry climate with sparse grass, and thus large herds of cattle required vast amounts of land in order to obtain sufficient forage. The need to cover distances greater than a person on foot could manage gave rise to the development of the horseback-mounted vaquero. Various aspects of the Spanish equestrian tradition can be traced back to Arabic rule in Spain, including Moorish elements such as the use of Oriental-type horses, the la jineta riding style characterized by a shorter stirrup, solid-treed saddle and use of spurs, the heavy noseband or hackamore, (Arabic sakima, Spanish jaquima) and other horse-related equipment and techniques. Certain aspects of the Arabic tradition, such as the hackamore, can in turn be traced to roots in ancient Persia. As English-speaking traders and settlers expanded westward, English and Spanish traditions, language and culture merged to some degree. Before the Mexican-American War in 1848, New England merchants who traveled by ship to California encountered both hacendados and vaqueros, trading manufactured goods for the hides and tallow produced from vast cattle ranches. American traders along what later became known as the Santa Fe Trail had similar contacts with vaquero life. Starting with these early encounters, the lifestyle and language of the vaquero began a transformation which merged with English cultural traditions and produced what became known in American culture as the 'cowboy'. The arrival of English-speaking settlers in Texas began in 1821, while California did not see a large influx of settlers from the United States until after the Mexican-American War. However, in slightly different ways, both areas contributed to the evolution of the iconic American cowboy. Particularly with the arrival of railroads, and an increased demand for beef in the wake of the American Civil War, older traditions combined with the need to drive cattle from the ranches where they were raised to the nearest railheads, often hundreds of miles away. Large numbers of cattle lived in a semi-feral, or semi-wild state on the open range and were left to graze, mostly untended, for much of the year. In many cases, different ranchers formed 'associations' and grazed their cattle together on the same range. In order to determine the ownership of individual animals, they were marked with a distinctive brand, applied with a hot iron, usually while the cattle were still young calves. The primary cattle breed seen on the open range was the Longhorn, descended from the original Spanish Longhorns imported in the 16th century, though by the late 19th century, other breeds of cattle were also brought west, including the meatier Hereford, and often were crossbred with Longhorns. In order to find young calves for branding, and to sort out mature animals intended for sale, ranchers would hold a roundup, usually in the spring. A roundup required a number of specialized skills on the part of both cowboys and horses. Individuals who separated cattle from the herd required the highest level of skill and rode specially trained 'cutting' horses, trained to follow the movements of cattle, capable of stopping and turning faster than other horses. Once cattle were sorted, most cowboys were required to rope young calves and restrain them to be branded and (in the case of most bull calves) castrated. Occasionally it was also necessary to restrain older cattle for branding or other treatment. A large number of horses were needed for a roundup. Each cowboy would require three to four fresh horses in the course of a day's work. Horses themselves were also rounded up. It was common practice in the west for young foals to be born of tame mares, but allowed to grow up 'wild' in a semi-feral state on the open range. There were also 'wild' herds, often known as Mustangs. Both types were rounded up, and the mature animals tamed, a process called horse breaking, or 'bronco-busting,' (var. 'bronc busting') usually performed by cowboys who specialized in training horses. In some cases, extremely brutal methods were used to tame horses, and such animals tended to never be completely reliable. However, other cowboys became aware of the need to treat animals in a more humane fashion and modified their horse training methods, often re-learning techniques used by the vaqueros, particularly those of the Californio tradition. Horses trained in a gentler fashion were more reliable and useful for a wider variety of tasks. The first large-scale effort to drive cattle from Texas to the nearest railhead for shipment to Chicago occurred in 1866, when many Texas ranchers banded together to drive their cattle to the closest point that railroad tracks reached, which at that time was in Sedalia, Missouri. However, farmers in eastern Kansas, afraid that Longhorns would transmit cattle fever to local animals as well as trample crops, formed groups that threatened to beat or shoot cattlemen found on their lands. Therefore, the 1866 drive failed to reach the railroad, and the cattle herds were sold for low prices. However, in 1867, a cattle shipping facility was built west of farm country around the railhead at Abilene, Kansas, and became a center of cattle shipping, loading over 36,000 head of cattle that year. The route from Texas to Abilene became known as the Chisholm Trail, after Jesse Chisholm, who marked out the route. It ran through present-day Oklahoma, which then was Indian Territory. However, in spite of Hollywood portrayals of the west, there were relatively few conflicts with Native Americans, who usually allowed cattle herds to pass through for a toll of ten cents a head. Later, other trails forked off to different railheads, including those at Dodge City and Wichita, Kansas. By 1877, the largest of the cattle-shipping boom towns, Dodge City, Kansas, shipped out 500,000 head of cattle. Barbed wire, an innovation of the 1880s, allowed cattle to be confined to designated areas to prevent overgrazing of the range. In Texas and surrounding areas, increased population required ranchers to fence off their individual lands. In the north, overgrazing stressed the open range, leading to insufficient winter forage for the cattle and starvation, particularly during the harsh winter of 1886-1887, when hundreds of thousands of cattle died across the Northwest, leading to collapse of the cattle industry. By the 1890s, barbed wire fencing was also standard in the northern plains, railroads had expanded to cover most of the nation, and meat packing plants were built closer to major ranching areas, making long cattle drives from Texas to the railheads in Kansas unnecessary. Hence, the age of the open range was gone and large cattle drives were over. Smaller cattle drives continued at least into the 1940s, as ranchers, prior to the development of the modern cattle truck, still needed to herd cattle to local railheads for transport to stockyards and packing plants. Meanwhile, ranches multiplied all over the developing West, keeping cowboy employment high, if still low-paid, but also somewhat more settled. American cowboys were drawn from multiple sources. By the late 1860s, following the American Civil War and the expansion of the cattle industry, former soldiers from both the Union and Confederacy came west, seeking work, as did large numbers of restless white men in general. A significant number of African-American freedmen also were drawn to cowboy life, in part because there was not quite as much discrimination in the west as in other areas of American society at the time. A significant number of Mexicans and American Indians already living in the region also worked as cowboys. Later, particularly after 1890, when American policy promoted 'assimilation' of Indian people, some Indian boarding schools also taught ranching skills. Today, some Native Americans in the western United States own cattle and small ranches, and many are still employed as cowboys, especially on ranches located near Indian Reservations. The 'Indian Cowboy' also became a commonplace sight on the rodeo circuit. Because cowboys ranked low in the social structure of the period, there are no firm figures on the actual proportion of various races. 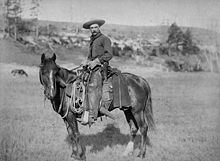 One writer states that cowboys were '...of two classes�those recruited from Texas and other States on the eastern slope; and Mexicans, from the south-western region....' Census records suggest that about 15% of all cowboys were of African-American ancestry�ranging from about 25% on the trail drives out of Texas, to very few in the northwest. Similarly, cowboys of Mexican descent also averaged about 15% of the total, but were more common in Texas and the southwest. Other estimates suggest that in the late 19th century, one out of every three cowboys was a Mexican vaquero, and 20% may have been African-American.